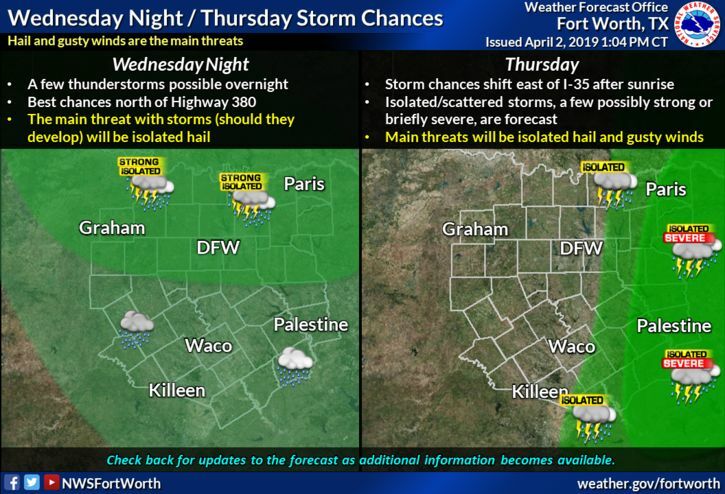 EXTENDED FORECAST – There is a slight chance for an isolated storm or two on Wednesday afternoon as moisture lifts northward. The main threat with storms, should they develop, will be hail and strong winds. Storm chances will increase overnight into Thursday with the highest storm coverage near and north of I-20. Storm threats will be large hail and strong winds. 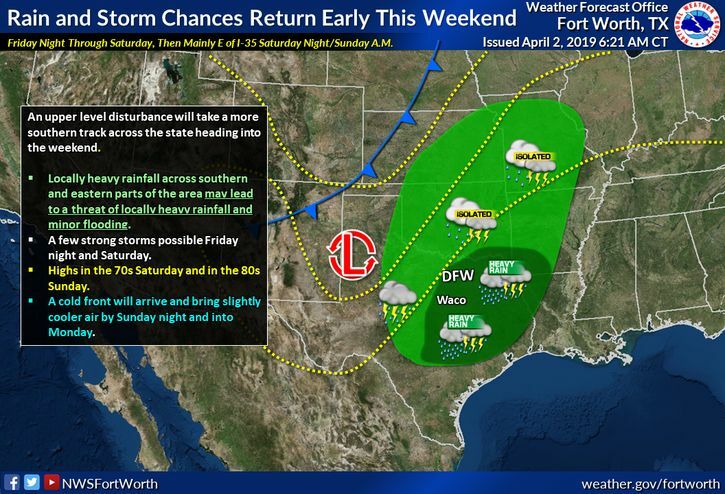 An upper-level disturbance approaches the area late Friday, before moving across later Friday night and the early morning hours Saturday. Isolated to scattered thunderstorms will initially form well west of North and Central Texas, before spreading eastward into areas west of I-35/35W during the evening hours. Showers and thunderstorms will become more numerous across the area during the overnight hours. A few strong, to even possibly severe storms will affect areas primarily across the western half of the region. Hail and gusty downburst winds are expected to be the primary threats. 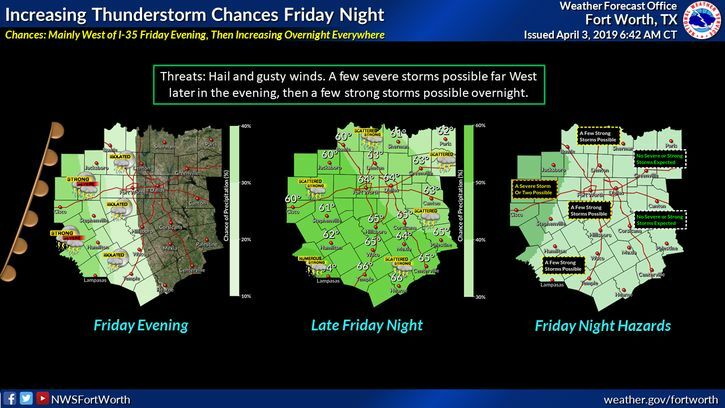 A few strong storms containing gusty winds and possibly hail may occur across North and Central Texas Saturday and Saturday night. Confidence is improving in the threat for localized heavy rainfall to between 2-3 inches across areas along and east of I-35. Widespread flash flooding is not expected, but minor flooding of typical low-lying areas may occur. Run-off from localized heavier rains may result in rises and possible minor flooding with main-stem rivers including the Brazos, Trinity, Sulphur, and Sabine River basins.